Great Tarp, Not So Great Color. We love our Noah's Tarps--9 ft, 12 ft, and 16 ft. The 16 ft tarp spends most of its summer pitched over our back yard, giving shade for the boys' play. Permanent pitch lines are at the ready, so we simply pull out the tarp, hook in the corners, and pull taut and tie-off at the cleats we've mounted in various locations. The smaller ones come with us camping, or even at beach house rentals, because a little extra shade is always welcome under hot blazing midday sun, pitched over the pool, or near the tent...a terrific multi-tasker. It's only limitation, by design, is the requirement of pitching it with opposing corners high. But that is the very nature of it's catenary cut, so I don't fault it for doing what it was designed to do. 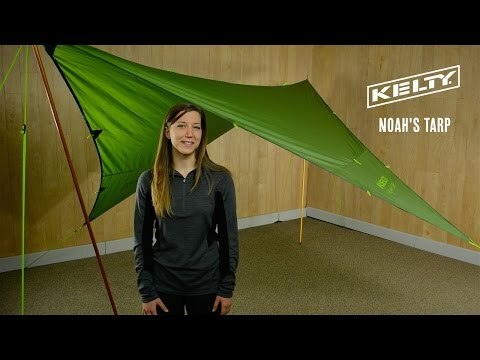 I fell in love with the Noah Tarp 9 a few years ago and now use this as my go-to tent and shelter. It is both light weight and highly versatile. Using two hiking poles and two to three 8ft para-cords (plus a few rocks if the wind is really bad), I can set up a secure, cozy and dry space in just a few minutes that will accommodate two people, a dog and gear! I've been in the Army for almost 9 years now. I'm currently training ROTC cadets for the summer in Kentucky. I picked up a Noah's Tarp 9, and I couldn't be happier with it. I love sleeping in the rain out here, because I'm dry as I could be. If there was a camo-pattern Noah's Tarp, I'm sure all my Soldier friends would buy them. Been re purposing these for more than a decade.